ROG Strix XG27VQ blends silky-smooth graphics and gorgeous gaming aesthetics to deliver incredible gaming experiences! It's the absolute best gaming monitor for professional gamers and MOBA aficionados. The Strix XG27VQ is a Full HD curved gaming monitor with an engaging 144Hz refresh rate. It features ASUS-exclusive Extreme Low Motion Blur and Adaptive-Sync (FreeSync™) technologies for incredible gameplay without tearing and stuttering. Its game-inspiring design integrates onboard ASUS Aura RGB lighting to add ambience to any gaming setup or LAN party. ROG Strix XG27VQ wraps its 27-inch panel around an 1800R curve, extending your field of vision so you feel fully immersed in the game. The display's curvature ensures every point is equidistant to your eyes, so you get a comfortable viewing experience, even during marathon gaming sessions. This monitor also lets you enjoy wide viewing angles with minimal distortion and color shift - so you get better visuals with games, movies, or anything else, from almost any viewing angle! With an astonishing 144Hz refresh rate, fast-moving visuals pose no problem for ROG Strix XG27VQ. There's no frustrating lag so you get the upper hand in fast-paced first-person-shooters, racers, real-time strategy, and sports titles. The ultra-fast refresh rate also lets you play games at the highest visual settings, so you can instantly react to what's onscreen and always be the first to strike! ROG Strix XG27VQ features the latest ASUS Extreme Low Motion Blur technology, which eliminates smearing and motion blur, and makes objects in motion look sharper, so gameplay is more fluid and responsive. Adaptive-Sync (FreeSync™) technology delivers the smoothest, fastest, and most breathtaking gaming visuals imaginable by eliminating screen tearing and choppy frame rates, and by minimizing display stutter and input lag. ROG Strix XG27VQ gives you seamless, lag-free visuals when playing the latest fast-paced first-person-shooters, sports, or action-adventure games. The ROG Strix series is a continuation of the ever-lasting legacy of ROG, with a bold, streamline design featuring the iconic tripod stand. The series is made using high- quality materials, skillfully crafted with the expertise and adventurous spirit synonymous with ROG. 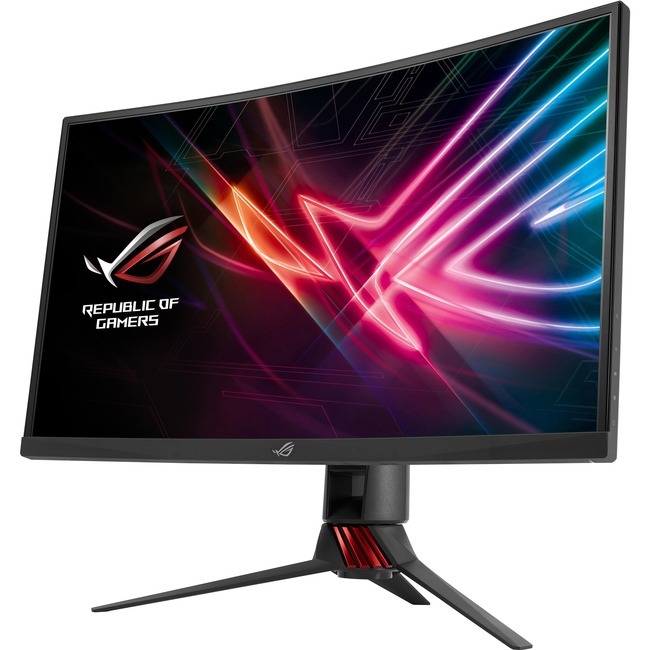 ROG Strix XG Series gaming monitors feature ASUS Aura RGB lighting on the back. It offers several lighting modes to provide a cool and stylish backdrop to any gaming setup.